A week from today, on July 23, President Rodrigo Duterte will deliver his third State of the Nation Address — his annual report to the Filipino people. As per Presidential spokesperson Harry Roque, viewers should expect a shorter speech from Mr. Duterte this time around as he said it would not exceed 35 minutes. Also new at this year’s SONA is the selection of filmmaker Joyce Bernal, who is taking over the directorial job from Brillante Mendoza. 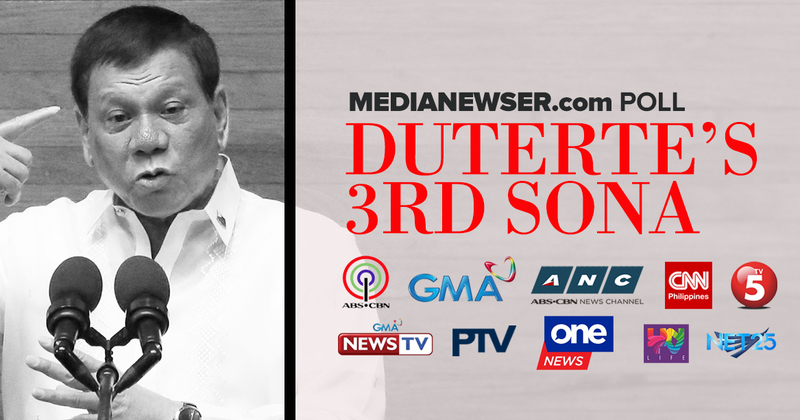 As a tradition here on our website, we’d like to know where on television do you plan to watch the third SONA of President Duterte. As usual, the choices are ABS-CBN, GMA-7, TV5, ANC, CNN Philippines, UNTV, PTV4 and Net25. Replacing Bloomberg TV Philippines this year, of course, is Cignal TV’s One News channel. Take our poll and leave your comments below. You can also participate in the discussion on our Facebook page or tweet us @medianewserphil. MNP Poll: Where on TV will you be watching the coverage of Duterte's 3rd SONA?